Not much is better than breadsticks and pizza! Pizza is something my entire family loves so we have it at least once a week. – and honestly I could eat pizza everyday! 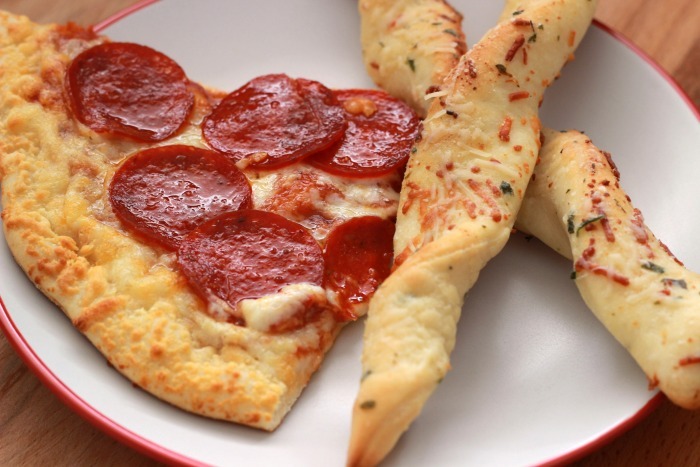 I am such a bread person so I love getting a pizza with great crust and some delicious breadsticks to eat with it. Oh and all of that yummy cheese! What could be better? When the kids were younger it was always cheese or pepperoni pizza. But now that they are older they are willing to try all different kids of pizza toppings. We let the kids pick out their favorite kinds so we have a differnt kind each week. Sometimes I will buy different toppings they can add to their pizzas as well – which they love! I love having a good variety of frozen pizzas in my deep freezer that we can make up in no time. 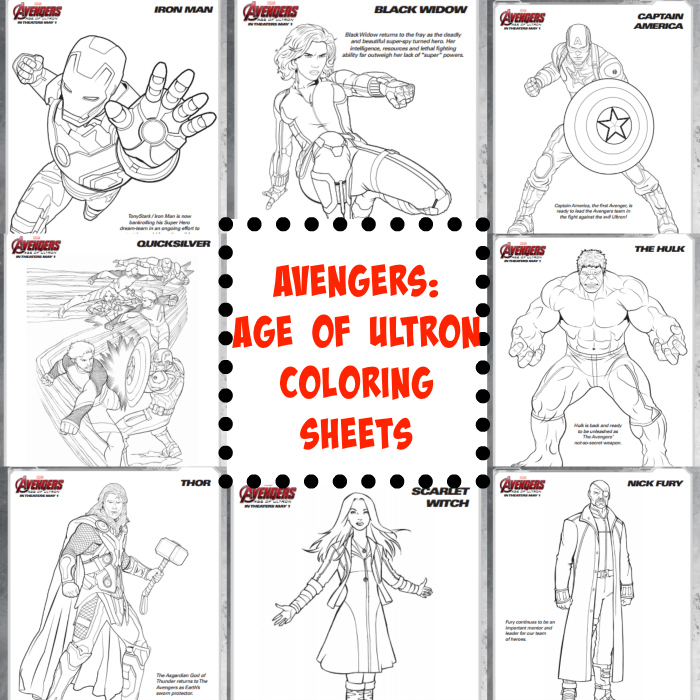 Helps make those busy nights so much easier – such a time saver! I also love to make homemade breadsticks. 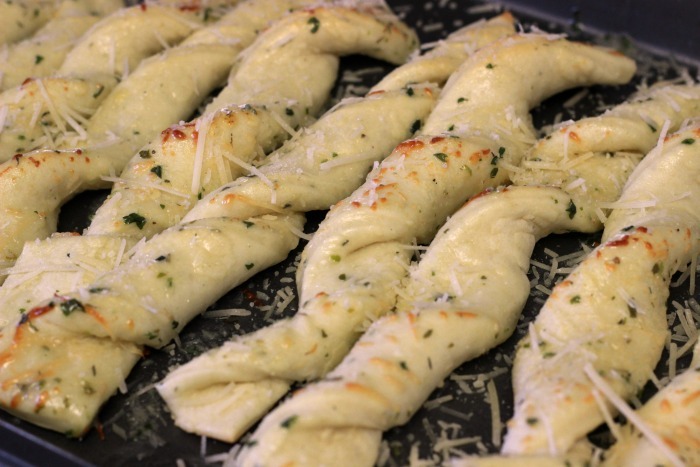 These Garlic Parmesan Breadsticks are easy to make and without much effort from me. I simply put everything into the bread maker and when the dough is ready I can easily roll it out and some butter, herbs and cheese and bake. They bake at the same temperature as my pizza so I made them first then make the pizza. The breadsticks are still nice and warm and so delicious along with the pizza. 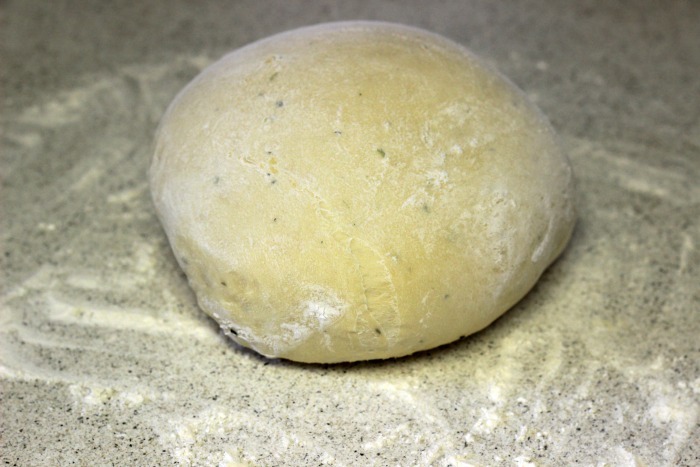 In your bread maker place all the dough ingredients except the garlic, parslye and thyme. Put on the dough setting of the bread maker and start it. If your bread maker is like mine it will mix the dough together for about 10 minutes and them beep or pause. At this point I add the garlic, parsley and thyme. This gets mixed into the dough as well through the cycle. 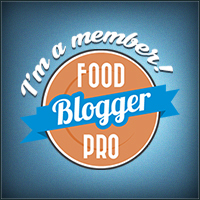 It is a great way to get some delicious flavors added to your bread. Once the dough cycle has completed (my bread makers complete cycle is an hour and 20 minutes) put the dough onto a lighlty floured surface. 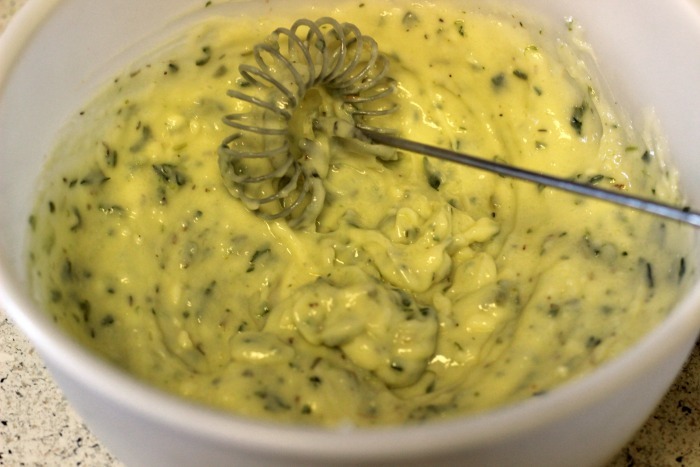 In a bowl mix together all of the topping ingredients except for the parmesan cheese and mix together. 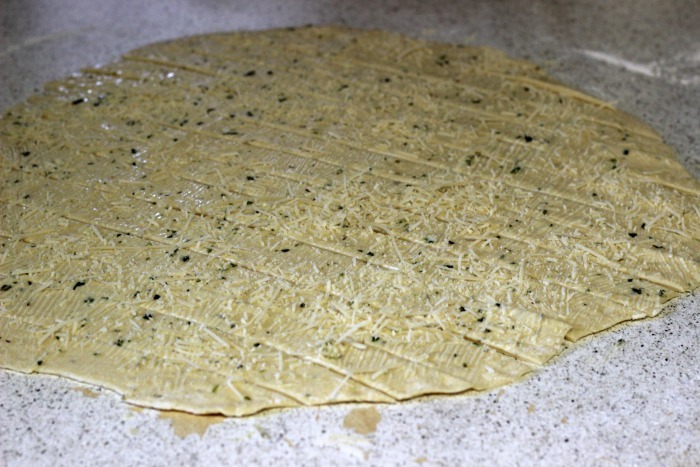 Roll the dough out and then spread about half of the butter/herb mixture onto the dough. Sprinkle on about 1/3 cup of shredded parmesan cheese and cut into strips with a pizza cutter. 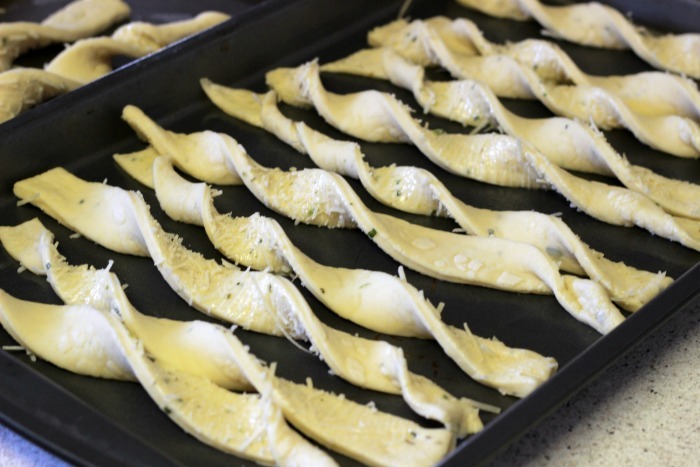 You can cook the strips of dough without doing anything special shaping or anything or if you want to make them a bit fun you can twist the dough a bit and then place on a greased baking sheet. 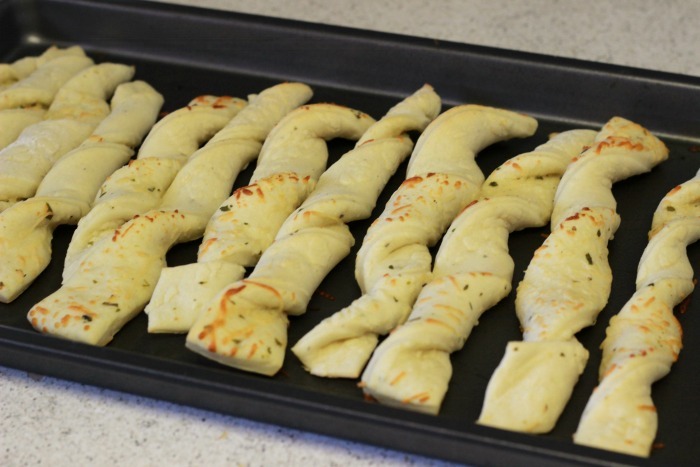 Bake in a 400 degree oven for about 10 minutes or until the breadsticks begin to have a golden brown look. and then put back in the oven for about 1-2 more minutes. 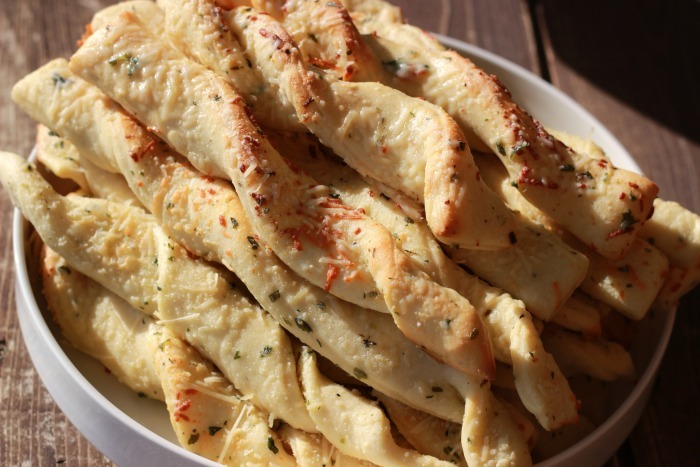 If your family loves breadsticks then they will just love these! Serve with your slices of pizza! You could add in a side salad as well. If you are like my family then you probably enjoy pizza just as much as us. In the past we have pizza for parties, movie nights, game nights and nights that I need something quick to feed my family. Sometimes I have had little fun pizza parties with the kids just for fun. They especially loved it when I made a pepperoni football pizza which is so easy to make from frozen pizzas and pepperoni. The kids are getting older but we still love pizza just as much! Now they all like all different kinds of toppings and the best part about frozen pizza is the kids are now old enough to make them on their own if needed. What is your favorite kind of pizza? Garlic, Parmesan, and carbs in pretty much any form are three of my all-time favorite things. Oh, plus pizza. 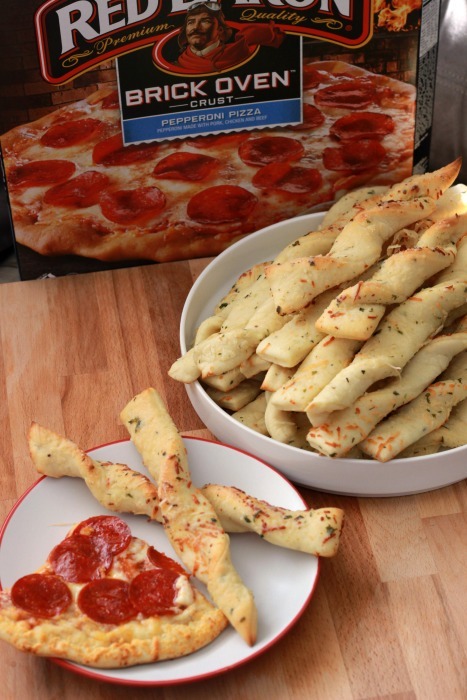 So these bread sticks have my mouth watering! You can’t go wrong with pizza for kids ? 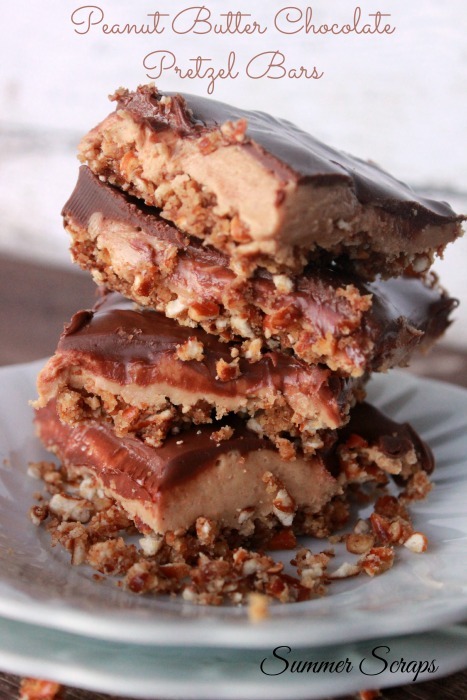 These sound so simple to make and look so yummy! I’m pinning this for later. I’d be happy just with those breadsticks! YUM!! 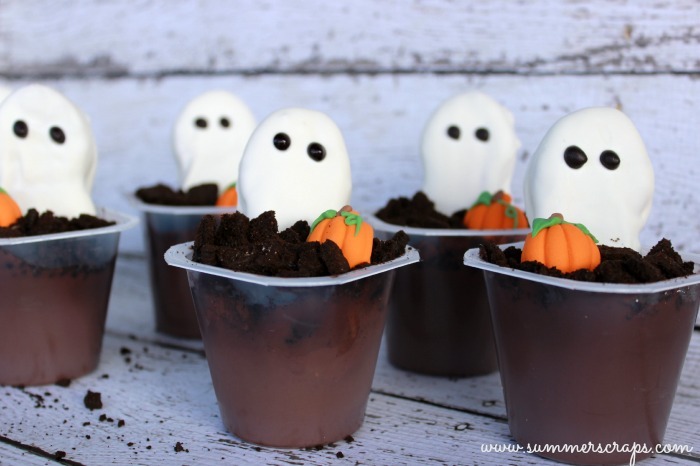 Thanks for sharing this with us on our Throwback Thursday link party! Why do I never make bread sticks? They’re so good! Thanks for linking up at #SaucySaturdays.